The Many Mini-Adventures of the Wards: We'll eat more chickin! 5. the large variety of dipping sauces - what the heck is polynesian sauce anyway? The kids also very much enjoyed all the cows doing the advertising. 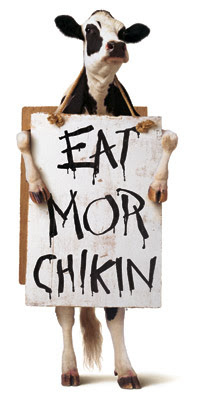 Why would a cow want us to "Eat mor chickin" ? We'll definitely be back. Now we're totally regretting not being one of those crazy people that camped out overnight before the opening. The first 100 people got 50 (or was it 100) free meals to Chick-fil-A! 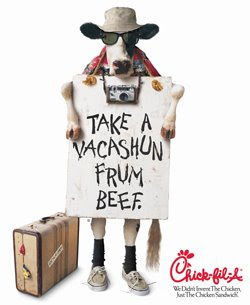 I didn't even know that Fresno didn't have any ChikFila until I heard someone else talking about people camping out...poor babies. You have to try the milkshakes and the brownie a la mode - their Ice "dream" tastes like homemade. One of my (many)favorite indulgences. I love their polynesian sauce! luckily jeremy got coupons at work for free chicken sandwiches and we love it! I Love Chick Fil A! On Tuesday nights they usually do a kids night. You get one kids meal free for each adult combo purchased. They always have fun things for the kids that night. The last time we went they had a face painter. The best part is it's free!